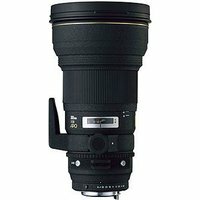 The Sigma 300mm f2.8 EX DG HSM Lens is a fast maximum aperture telephoto lens optimised for digital SLR cameras that feature a full-frame sensor. The Internal Focus system ensures the overall length of the lens does not change during focusing, ensuring convenient handling and ease of use. The HSM (Hyper Sonic Motor) provides fast, silent AF function as well as full-time manual focus override. This lens is suitable for both cropped sensor and full-frame sensor cameras.